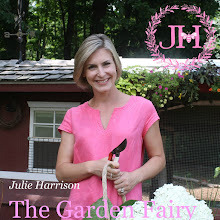 Julie The Garden Fairy: Lilly Pulitzer- The Gardener? Yesterday I received my spring copy of the Lilly Pulitzer catalogue in the mail. This is a catalogue after my gardening heart! If the cover wasn’t enough- beautiful bright pink peonies (silk or fresh, they are lovely! ), a peek inside had me from the first page flip! L.P. is known for their bright, Palm Beach style patterns but what I especially love are all of the floral designs. You can practically smell the soft fragrance of the cherry blossoms, lilies and lupines coming off the pages. I’m pretty sure any gardener will find this spring’s line irresistible. L.P. did an entire paragraph on day lilies on page 32. The variety called Stella d’Oro was the inspiration for the print called Star Fruit Yellow Daylily. I’m also a fan of Stella d’Oro- the flower stems reach a nice (shorter) height and the true yellow flowers bloom nearly non-stop from late spring through late summer. Plant them with Daffodils and your season of yellow fellows will be even longer AND the foliage of the Daffodils will blend in with the foliage of the daylilies. Don’t you love it when plants work together like that? I might have to get this tie for my husband, he is married to a horticulturist after all! This dress is amazing with cherry blossoms!